At one time Barrie Voisey used to regularly have stands at the Woodworker Show, the Model Engineer Exhibition and the Midland Model Engineer Exhibition, as well as attending many County Shows and Exhibitions throughout the country. The firm produced kits and materials for the model maker for many years as the hobby of model wheelwrighting became very popular during the 70's and early 80's, and people would travel for miles to visit the shop in Fenton, Stoke-on-Trent, Staffordshire. However, with the onset of the economic recession in the early/mid 1980s the business scaled down and eventually closed, The following selection of plans is the most detailed and popular in this range, produced solely for the model maker, they give very complete details of the method of construction, including materials, lists and patterns for each part. 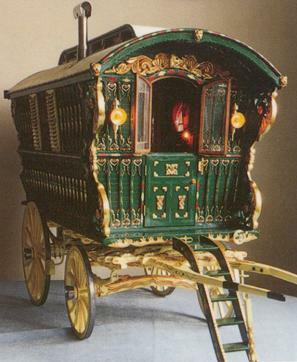 LIGHT WAGONETTE The plans for this wagonette were the last to be drawn by Barrie Voisey, and indeed were not published until a model from the plans was commissioned to feature in my book "Making Model Carriages". 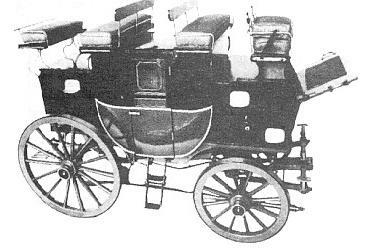 I recommend this plan for anyone seeking to make his first carriage model; constructing the framed body is a good way to learn about the structure of carriages and every part is shown clearly on the plans. DUNTON READING CARAVAN Based on a Reading caravan built by Dunton, this design alo includes some decorative features derived from other well known caravan builders, such as Wright and Tong, so that it is typical of the style rather than a reproduction of a specific prototype.The drawings of the 1/10th scale model are excellent, showing clearly how to construct every part and giving cutting lists and patterns for both the exterior and interior fittings. Even the construction of the stove and lamp is detailed, and designs for miniature crockery are included. 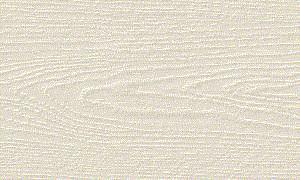 The instructions give advice on selection of timber,show how to make up the springs and other metal fittings and detail the painting and carving. The model, (shown right) has been built by Lance Stapley, a professional model maker, with the decorative paintwork done by his wife June. YOUNG & Co. BREWERS DRAY Built around 1910, this dray was used for many years in delivering barrels of beer from the Wandsworth brewery of Young & Co. to public houses around London. 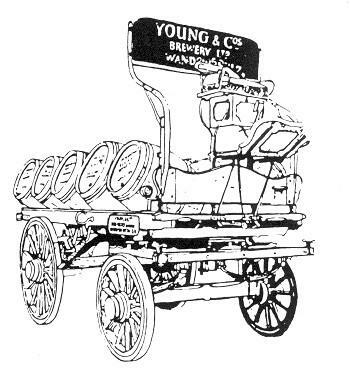 It can carry 14 barrels of "Real Ale" for which Young & Co. are renowned. On the round two shire horses would be used, but the dray is now used for show work with with a team of up to eight. The plan gives comprehensive details of the construction of the model with cutting lists. Drawn by Barrie Voisey. NAPOLEONIC FIELD GUN AND LIM BER This is the type of gun developed for Napoleon III, and subsequently used by the British and U.S. armies in the second half of the Nineteenth century. 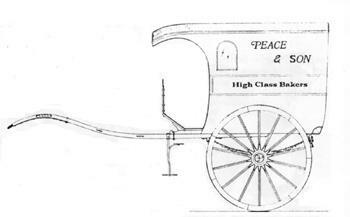 The limber was used to transport the gun, and also carried the ammunition boxes, and a further ammunition waggon would have followed up the rear. This was the last set of plans designed by Barrie Voisey, and is considered by many to be his best work. The fine 1/12th scale model shown above was made by "Radish" who lives in Brisbane,Austrialia. It is painted, with all metal parts chemicl blackened. To see more pictures on this model go to the "Model Gallery" page ot this web site. Here - http://community.webshots.com/user/radish1us you can see more photos, some showing detail of wheel construction. FLAT LURRY (HEAVY DUTY DRAY) This goods vehicle is a type which was used around docks and railway yards. 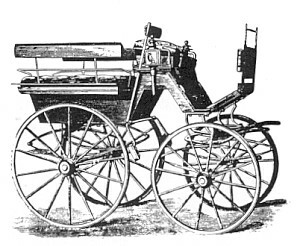 It was capable of carrying up to four tons and is strongly reinforced with iron straps and mounted on heavy wheels. The design is from an artical published in a trade journal in 1899. ENGLISH ROAD COACH This plan shows the livery and fittings of a private road coach,although the basic structure is similar to the public stage coaches, and the livery of one of the famous coaches such as the "Red Rover" could be used if you wish to do so. As with all the Voisey plans the construction of all the fittings for the model is shown clearly, often in exploded detail. The interior seats and the braking are well detailed, and a complex subject is made quite straighforward for the modelmaker. DELIVERY VAN A light one horse van of the type used by bakers, butchers and grocers for town deliveries. These vans were usually turned out very smartly to maintain the reputation of their owners - possibly you could finish it in a livery to suit your local shop. FARMERS FLOAT A well built crank axle cart with curved sise panels and a low slung body, this is definitely a working farmers vehicle capable of standing up to hard wear. There is a seat for two and plenty of space behind and below for goods. BENT PANEL CART A type of dog cart especially popular with ladies because although not seen in this view, the tops of the sides curve outwards servind as an efficent mudguard and the well in front protects the feet. The false louvres on the side hark back to the days when dogs were carried in the closed space under the seat, and this gives it a very sporting appearance.